In the language of the Wappo Indians who originally lived in the Napa Valley region of Northern California, Napa means “land of plenty”. It aptly describes the lush area a few miles inland from the Pacific Ocean— with a Mediterranean climate of warm days and cool nights, and just enough fog to create conditions ideal for producing a wide array of grape varietals. Cabernet Sauvignon, Chardonnay, Sauvignon Blanc, Pinot Noir, Merlot, Cabernet Franc, Zinfandel, Sangiovese, Syrah, Petite Sirah, and Petit Verdot all thrive here. Less than an hour’s drive north from San Francisco’s Golden Gate Bridge, Napa Valley is considered a New World wine region even though grapes and wine have been produced here for more than 150 years. The Charles Krug Winery is credited as the first winery in the area, having been established in 1861. In the late 19th century there were 140 wineries in the area, but most closed after a double hit— The grape disease phylloxera in the 1890s, followed by Prohibition in 1920, when only a few wineries were permitted to produce "sacramental wine". It wasn’t until the 1960s and ’70s that Napa had truly begun to establish itself as a noteworthy wine region. The Cesare Mondavi family had owned Charles Krug since the 1940s, but son Robert Mondavi left to establish his own namesake winery in 1966; he is often credited with establishing the first of the new wave of Napa Valley wineries. Today, wineries are plentiful in northern California, with over 400 located throughout Napa Valley alone. Napa has become a choice destination for visitors to discover, learn about grapes and winemaking, and taste many excellent wines. Jack Cakebread purchased a ranch in Rutherford just after returning from a photo shoot when he fell in love with Napa. Three decades later, he and his wife, Dolores, still own and operate the winery with their sons Bruce and Dennis, and have maintained the same passion for the land. Twenty-five years ago, they started the American Harvest Workshop, an annual four-day seminar where top chefs, wine and food writers and food purveyors join together. Cakebread also offers a series of cooking classes that include a three-course lunch with wine pairings. Cakebread produces many wines including a wide line of estate, reserve, and single-appellation Cabernets intended for aging. A love for French Bordeaux varietals led Dan and Margaret Duckhorn to found their eponymous vineyard in Napa Valley in 1976. What started as a charming farm stand on the Silverado Trail has evolved into a beautiful farmhouse with a distinctive tasting room. Guests are seated and provided with a wine menu. Duckhorn Vineyards bottles several elegant Merlots and Cabernet Sauvignons that showcase its premium vineyard sites. The Duckhorn Wine Company family includes Duckhorn Vineyards, Paraduxx, Goldeneye, Migration, and Decoy. John Williams founded Frog’s Leap in 1981 in the Napa town of St. Helena, and in 1994 moved the operation to the historic Red Barn Ranch in Rutherford. Williams is committed to green operations. The winery is LEED certified, utilizing solar energy along with geothermal heating and cooling. Frog’s Leap has been farming organically for over 20 years and currently dry-farms over 200 acres of certified organic vineyards. Using the most traditional and hands-off approach to winemaking, Frog’s Leap’s creates wines that respect their land. Varietals include Sauvignon Blanc, Zinfindel, Cabernet Sauvignon, Merlot, and Frögenbeerenauslese, modelled after a German-style dessert wine called Trockenbeerenauslese. Frog’s Leap also has a working farm that provides seasonal produce. Proprietor Kathryn Walt Hall got her start in the wine industry managing her family’s vineyard in Mendocino, California. Trained as an attorney, her career has included a stint as the U.S. Ambassador to Austria. Today she and her husband, Craig Hall, have created one of the most beautiful wineries in Napa Valley and produces some of the best wines in the world. Hall was the first LEED gold-certified winery in California and practices organic farming, producing Sauvignon Blanc, Merlot, and a group of powerful Cabernet Sauvignons that have won many accolades. The Cabernet Sauvignon is full-bodied, with soft tannins in the glass with scents of cherry, chocolate, and spice along with flavors of blueberry, cassis, anise, and chocolate. Hall has two locations: The St. Helena winery is open daily for tours; and the Rutherford location, open by appointment only, produces rare wines in 14,000 square feet of caves showcasing the winery’s art collection. Kick off a wine country day with a glass of sparkling wine, Mumm Napa’s specialty. Take time to learn how bubbly wines are made. Mumm tours are fun and informative– Walk through a fine photography gallery and complete your tour sitting on the patio soaking up the Napa sunshine with a glass of Mumm Brut Rosé. Vines from French roots producing California fruit make for a superb Champagne-style sparkling wine with tiny bubbles and complex tastes. The vintage wines showcase the best of each year’s harvest. Any event is a celebration with Mumm Napa 2001 DVX (named for founder Guy DeVaux), a delicate and creamy sparkling wine with aromas of vanilla, butterscotch, and oak spice, followed by green apple, peach and fresh raspberry flavors, and a long, refreshing aftertaste with endless bubbles. One of Napa Valley’s great estates, founded in 1970, Raymond Vineyards is situated in Rutherford, the heart of Napa Valley. The property was purchased in 2009 by Jean-Charles Boisset and is now part of the Boisset Family Estates collection of wineries which includes several in France, as well as Canada, California’s Russian River Valley, and Buena Vista Carneros, an historic winery in Sonoma. Boisset is committed to honoring Raymond’s legacy while creating and adding his own personal style. You’ll find a renovated property with a gorgeous decanting room featuring a Baccarat chandelier and crystal. Boisset is devoted to sustainable, organic, and biodynamic farming. 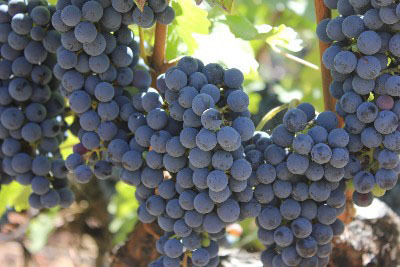 Raymond wines include several notable Cabernets. The most visited winery in the region, this famous mission-style winery was founded by the late Robert Mondavi and has stood as a Napa landmark since 1966. For more than four decades, Mondavi’s winery has led the California industry with innovations in vine growing and winemaking, as well as education, arts, and culture, with many events organized by his widow, Margrit Biever Mondavi. The winery was among the first in the United States to establish a culinary program with world-renowned chefs. Robert Mondavi popularized Fumé Blanc to distinguish his dry-fermented barrel-aged style of Sauvignon Blanc. The Fumé Blanc grapes are grown in Mondavi’s To Kalon vineyard. This wine is a good choice for warm weather months, with big tastes of lemon and peach. The Cabernet Sauvignon Reserve has flavours of dark, luscious fruit; the right ratio of oak to wine makes for a bottle filled with smooth tannins and a very distinctive taste. The winery itself has a beautiful tasting room and gallery filled with art and books. Sterling sits high above Calistoga, with panoramic views of Napa Valley. Founded in 1964 by Brit Peter Newton, then rebuilt at its current location in 1973. Sterling is currently owned by Diageo, a holding company for several beverage brands. A unique property, with its striking Greek-style stucco and an aerial tramway that transports visitors from the parking lot to the winery. The winery’s towers house eight bells from London’s Church of St. Dunstan-in-the-East, originally founded in the 10th century. Sterling Vineyards offers beautiful outdoor terraces and elegant tasting rooms, as well an informative self-paced tour. Merlot is the benchmark wine here, ruby in color, with aromas of ripe black cherries, raspberries, and cedar. Luscious fruit flavors of blackberries and cherries accented by a touch of toasty oak lead to a long, silky finish. Enjoy this wine paired with grilled meats and aged cheeses. For a most enjoyable wine country tour, plan ahead. The two main roads, St. Helena Highway (Route 29) and the Silverado Trail run the 30-mile length of the valley, passing through several towns. 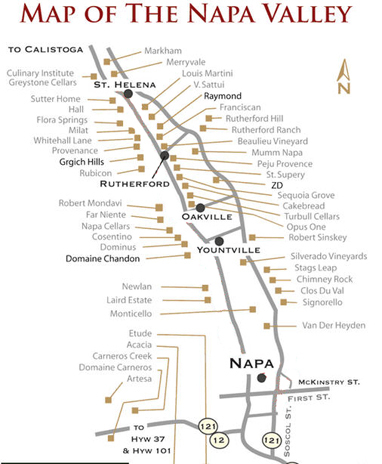 Yountville has a high concentration of legendary restaurants including Thomas Keller’s The French Laundry. In Oakville, everyone loves stopping at the Oakville Grocery for specialty foods and sandwiches. Browse through St. Helena's lovely boutiques. Pick up some cheese, charcuterie and a baguette at Dean & DeLuca for an outdoor picnic. Calistoga offers an air of the Wild West. Rutherford has the beautiful Auberge du Soleil, the perfect place to toast the sunset.